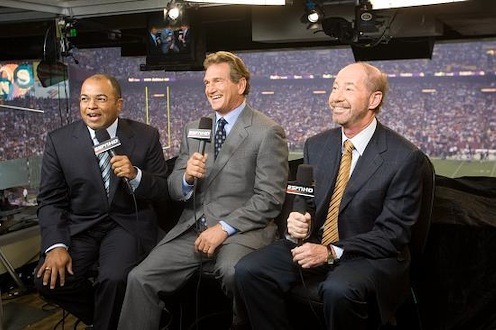 Paced by a record crowd for the Oct. 23rd Dallas Cowboys-New York Giants game, ESPN's Monday Night Football proved to be a rookie sensation in the ratings. Nielsen Media Research data says that MNF averaged 9.109 million homes and 12.325 viewers in its first year away from ABC. The 17-game package included an all-time cable high for the Cowboys-Giants, which had a 12.8 rating (11.807 million homes) and was seen by 16.028 million total viewers. That broke the old record of 11.2 million homes for a 1993 NAFTA debate on CNN's Larry King Live between Al Gore and Ross Perot. MNF's household and viewer numbers put it high on the charts among all prime-time programming this season. In households, MNF is No. 26, between ABC's Ugly Betty and CBS' New Adventures of Old Christine. And in total viewers, MNF is 27th. Both rankings are far higher than any cable series, including The Sopranos, has gone before. The final season of MNF on ABC averaged 11.835 million homes and 16.209 million viewers to respectively place 10th and 12th among all prime-time series.